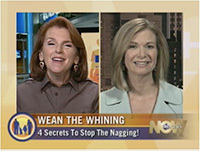 When it comes to solving tricky parenting problems, The Today Show and national media outlets turn to Amy McCready. Amy McCready is the Founder of Positive Parenting Solutions and the best selling author of The “Me, Me, Me” Epidemic – A Step-by-Step Guide to Raising Capable, Grateful Kids in an Over-Entitled World (Penguin, August 2015) and “If I Have To Tell You One More Time…The Revolutionary Program To Get Kids To Listen Without Nagging, Reminding, or Yelling”. (Penguin, 2011). She is a regular contributor on The TODAY Show and has also appeared on Rachael Ray, CNN, CBS This Morning, Fox & Friends, MSNBC, and elsewhere. Is Swearing the New Normal? Is My Kid A Brat? My Carolina Today – Why do kids really misbehave?